Global equity markets record an unprecedented year of performance and market conditions look supportive of further gains next year. The year is in its last days and barring a bombshell in the last couple of weeks, 2017 will go down as one of the most remarkable on records. Few investors expected the S&P 500 to post gains of close to 20% with near-record low volatility while enduring geopolitical tensions, massive natural disasters, political infighting in Washington, and a tighter monetary policy. The U.S. economy has picked up steam; with back-to-back quarters of 3%+ growth and the employment picture is healthy, with claims near record lows, unemployment at 4.1% and a solid 228,000 jobs being added in November, according to the Department of Labor. 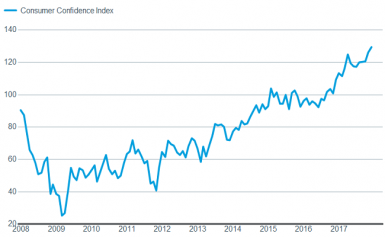 Further, business and consumer confidence is booming, both the manufacturing and services Institute for Supply Management’s indexes show robust growth, and the Index of Leading Economic Indicators continues to rise. Housing is also picking up again, with housing starts rising nearly 14% last month (Census Bureau), and existing housing inventory is down over 10% year-over year (National Association of Realtors). But there’s a downside to all the good news; expectations are becoming elevated and could morph into a bar set too high for actual data to hurdle in 2018. In terms of corporate earnings growth, Thomson Reuters’ 2018 S&P 500 consensus earnings forecast is above 11%. Although a boost from tax reform is potentially in the cards, elevated valuations suggest that any disappointment relative to those expectations could bring heightened volatility and/or pullback risk. Tax reform is moving along, and odds are improved that it will cross the finish line; the final form is still in question, as is the ultimate impact on the economy. Judging by market movements on tax news, investors are optimistic about passage; while hopes for an infrastructure package seem to be falling as midterm election season heats up early next year. Finally, there is the Robert Mueller investigation wild card, which could also wreak havoc with investor sentiment. There doesn’t appear to be any waning in the desire by the Federal Reserve to continue normalizing policy, as evidenced by the near-certainty of a rate hike in December. However, with Jerome Powell taking over the Fed chair position in 2018, and several new members set to be appointed, uncertainty is elevated. Judging by the comments from Powell during his confirmation hearings, continuity and transparency are priorities; but if inflation should flare up, or growth start to lag, the Fed may be challenged early in the new regime. With the rises in the US markets over the last year, how can investors see whether the rise is justified and not a bubble? 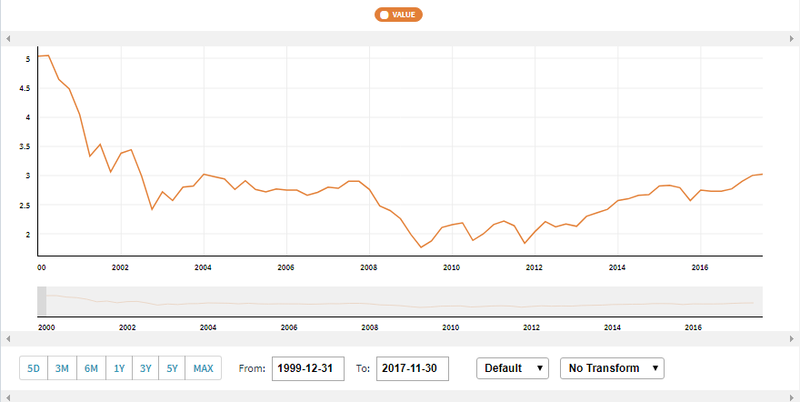 A good indicator is to look at the Price to Book Value for the S&P 500 over the last 17 years. This provides a good historic indication on whether the US Market is becoming overvalued in comparison to the components’ assets. Price-to-book value is the ratio of market price of a company’s shares (share price) over its book value of equity. This number is defined as the difference between the book value of assets and the book value of liabilities. Generally speaking, if the ratio is lower this is a positive indication because it suggests the price is low compared to the companies’ assets in the index. After a year with uninterrupted monthly gains, it seems safe to say that 2018 may bring more volatility in global stocks. We may see some red next year, but like the U.S. market, it appears to us that a steep bear market is unlikely. Our near-term outlook for global stocks in 2018 is therefore positive. We believe most markets are not too expensive to post further gains in the later stage of the economic cycle, as long as earnings continue to rise with economic growth next year.